· Switch cloth diaper detergents every so often. Maybe even every other load! I like to use Rockin' Green Soap on my diapers, but I have found it to be a bit harsh on the natural fibers of my inserts. 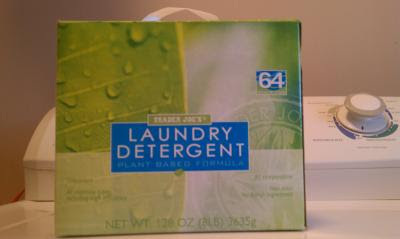 So, I like to rotate washes between the Rockin' Green Soap and the dry natural unscented laundry soap in the box from Trader Joes. That soap, is also much cheaper than Rockin' Green and it is nice to know about in case you are out of soap for cloth diapers and you need something in a pinch and can't wait for an online order to be shipped. 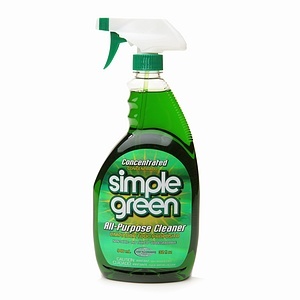 · Spray poop that you can't rinse off your dipes with your toilet sprayer with a little of the non-toxic biodegradable household cleaner, Simple Green, before you put the diaper in your wet bag or pail. This really helps with smell and build up in the diapers. If it freaks you out to do something like that, then just ignore that advice. I just know it has helped me tremendously in being able to keep my diapers more clean and less ammonia smelling. I also use Simple Green to spray poop stain on baby clothes. 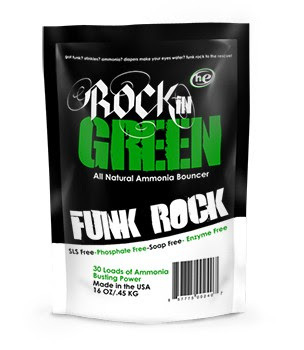 If I spray right away, the stains wash right out of the clothes in the wash.
· Rockin' Green Soap's Funk Rock Ammonia bouncer is a must have for cloth diaper care in our house. Once or twice a month when my diapers are starting to smell a little funky, I throw some in with my diapers for a rinse before I wash them with the soap and they perk right up. · Sun drying is a natural way to help lighten stains in the dipes and to alleviate stink and build up, too. Though, I always like to throw the diapers in the dryer for about 10 minutes or so before they are completely dry on the line so they aren't hard and crunchy on baby's bum. · Don't use softener sheets while drying your diapers - that can cause build up and reduce absorbency. · Now that I have had experience cloth diapering two children - a boy and a girl, one skinny and one chubby - I really would have done several things differently from the start. My #1 thing? I would have really diversified my stash. I will be increasing the diversity of my stash over time from here on out. 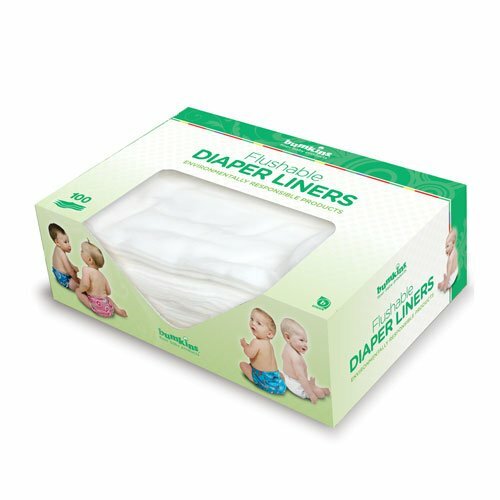 · I also wish I would have thought to do a clothdiaper rental service to try out a variety of diapers, used a site like this one to trade/buy diapers, or would have bought some of my diapers off of craigslist, gently used or new. I could have gotten a better idea of what I wanted and what worked better for each child sooner, and would have saved more money. 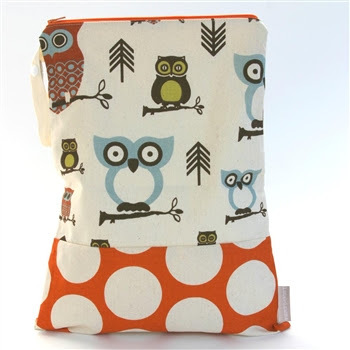 · On-the-go wet bag recommendation: Logan and Lenora, all the way! I would not have bought a small Planetwise wet bag for my diaper bag, I would have just bought this classic Logan and Lenora wet bag for on the go. Sooo much higher quality, less leaky. More expensive, but completely worth it. I wish they made it in bigger sizes for my every day at-home wet bags, I would buy three. · I would focus on absorbency more than ease of diapers stuffing. I would NOT purchase any gCloth re-usable diapers liners for gDiapers - ONLY Joeybunz Hemparoos or maybe another brand, Grovias or Thirsties perhaps. This suggestion totally undercuts what I said in this post. Experience with two kids and their changing stages has proven this previous opinion of mine to be poor advice. · I would worry less about the size and bulkiness of the cloth diapers for at-home wearing and just get diapers that are more absorbent. · I would have a few more all-in-ones to cut prep time. - Only using a half of a wipe for wet diapers. once or twice more. They are much softer than the cloth wipes. - Only use water, no special solutions for them to be dipped in. · Cloth diapers do leak more than disposables. I have found that as my son has gotten older and pees more, that disposables have become necessary for sleeping at night. · Disposables cause blow outs in ways that cloth diapers never do. Also, I don't recommend babies wear disposables if they are being worn in a carrier or a Bumbo baby seat! · Cloth-diapering exclusively breast-fed babies is a breeze. I would recommend cloth diapering to everyone who is planning to exclusively breast feed their babies! It saves money, takes very little extra time, and is super low maintenance. (No diaper spraying necessary!) Though, waiting for a couple of weeks is recommended until the Meconium is all out of their system and they plump up just a bit. Seriously, it is so easy! DO IT! · Once babies are eating solid foods 100%, however - cloth diapering becomes a whole new beast. Older babies eating solids and toddlers, pee more, their poop is smelly and you have to deal with it. But if you are committed to the environment and/or saving money for your family - cloth diapers can still be a great choice for you. Just know that once solid food is introduced, there will be more of a learning curve. That usually means introducing a second liner to the diaper, changing the diaper size or fit, or installing a diaper sprayer to use on your toilet! · For myself, surviving with two kids who are cloth diapered I have had to loosen up my cloth-diaper-only ideal a bit, as well as implement a product to make it easier for me. Mainly, I use Bumkins flushable diaper liners to help with poop - which I only use for Lincoln's diapers. They make it sooo much easier and more quick to clean his diapers. And though they do add a small cost to our budget, I figure they help keep my diapers nicer by blocking some of the poop from getting into the diapers as well as keep me cloth diapering, so they are worth it. If you are a veteran cloth-diapering mom, PLEASE! Share YOUR advice in comments below! Okay. I have a few things to add. One is that you do not have to use cloth diaper detergent. Most of the cloth diapering moms that I know use Tide and have tried many others and have found Tide to be the best option for them. Work at home mom cloth diapers are the best quality and the cutest. Our pediatrician recommends wiping bums with a washcloth and water. No disposable wipes or cloth wipe solution. Diapers with a PUL outer are going to stay drier than diapers with a woven outer. The best night time solution is fleece with no PUL. Spots Corner on hyenacart has lots of used options if you want to try things out, otherwise Hyenacart has tons of work at home mom choices. If you are wanting to really save money, prefolds and covers are the way to go. I don't cloth diaper, but I just wanted to comment on the blowout issue. My baby rarely has blowouts, and has never had one while we've been carrying him in our carrier. You do have to use a disposable brand that fits best on your baby though- we had more leaks/blowouts when we tried huggies and up & up (Target) and almost never when we use pampers swaddlers. And his pee leaked every night when we tried pampers baby dry diapers. I always recommend your blog to friends who are considering or new to cloth diapering- good posts with good information! Thanks for the tips Jami! also, I know women spend TONS of money on cloth diapers. I'm just starting out with it, but my sister gave me a web site that you can get the from thats super affordable! its www.superstash.net for anyone who is looking to get a stash. I agree with the other Amy. Tide! I just started using it with baby #3 and I love it so far. Another thing I have learned is bamboo or hemp fitteds or bamboo or hemp prefolds with a cover are the way to go for night time. Also, I agree with the flushable liners. I really like the grovia ones because they are so wide. The ones we have now (bummis) are so narrow they only catch half the poop. I am so glad that you've given updated information as you've gone through the cloth diapering process! It's helped me a lot when I've thought about my options for the future. I loved your "my stash" post, and I am VERY curious how you would update that now. If you ever had time, I'd love to see a post about what stash you would recommend now, for parents starting to cloth diaper! Jaime - I haven't personally tried enough diapers to give you specifics, but I am looking in to purchasing some Bum Genius, Grovias and Thirsties for when I restock my stash a bit in the future. Some of my liners, are starting to shred having been through 3 years and two kids now and we're not done having kids yet! I purchased some flip inserts from a friend. Those work pretty well, though I find them a bit more bulky than the Joey Bunz, even with my double stuffing them in the diapers. I would do a cloth diaper rental service and try out several different kinds before you buy so you can see what you like best. I also would have tried harder to buy used diapers to cut down the cost. Everyone is different. It's just about finding out what works best for you and your baby. And if you use it for more than one child, down the road - that's where the diversity helps. Does that help at all? Wow so much useful stuff in this and your previous posts.